This month, we’re focusing all of our energy on ways to save a little electricity and keep those summer bills a little lower. One of our favorite ways to decrease energy usage is to swap inefficient light bulbs for newer LED models. This concept might not be too new, but did you know that you can also switch out linear fluorescent bulbs for more efficient LED models? The Philips InstantFit LED T8 Lamp is one of the best ways to decrease your electricity consumption. 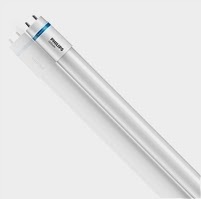 These linear LED lamps fit right into your fluorescent lighting fixtures — no retrofit required! If you’re looking to maximize the value of your ballast replacement, Philips LED lighting solutions are right for you. Between its low energy consumption and long lifespan, this linear light bulb can offer you significant savings for your home or business. This bulb is rated to light a room for 40,000 hours, meaning you’ll have to replace it a lot less often than a fluorescent bulb. At Energy Saving Lighting, we’re proud to offer this light bulb for a great price: only $24.95! With our free shipping offer on all orders of $75 or more, you can save even more by stocking up. What’s your best tip for lowering your energy bills during the summer? Let us know in the comments!